WILMINGTON — The following information is obtained from the Clinton County Health Department and is compiled from inspection reports. Violations are either critical or non-critical. Critical violations are more likely to contribute to food contamination, illness or an environmental health hazard, including inadequate cooking of food items or poor personal hygiene. 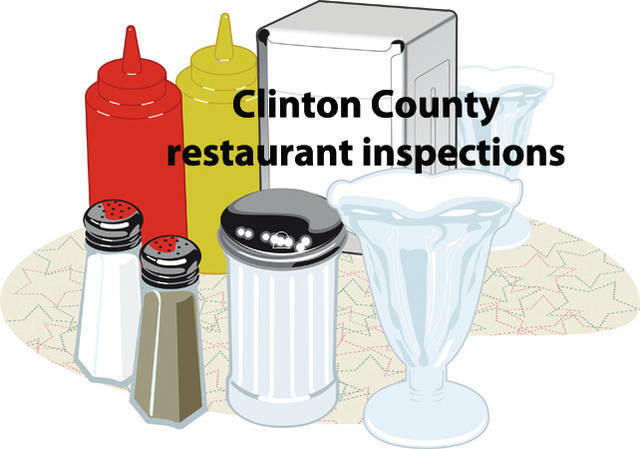 For a more detailed description of critical and non-critical violations, or to file a public health or food safety complaint about a restaurant, contact the Clinton County Health Department by calling 937-382-7221. • UHl’s IGA, 444 E. Washington St., Sabina, March 8. Follow-up. Bottom shelf and food product sill not 6 inches above floor in walk-in cooler in deli dept.Hot plate and microwave in deli dept. is not commercial or NSF (or similar) rated. Black accumulations (mold-like) on ceiling surfaces in retail sales area. Ice accumulated in main and deli/bakery walk-in freezers. Lights nonworking in deli/bakery prep areas. • Engine House Pizza Station 2, 416 E. Washington St., Sabina, March 13. Follow-up. Fire previous violations corrected. Thank you! Critical: Hot water at the hand sink is broken and shut off; must turn on manually when need to use. Owner stated that he cannot find part for sink so he will have to replace. Employees not wearing hats or hairnets. There were rusted shelves in the Beverage-Air cooler. Pizza/sandwich/salad prep cooler, the lid is coming apart in the back. • Jen’s Deli, 28 W. Main St., Wilmington, March 8. Follow-up. Critical: Mouse droppings found on floor in basement food prep area. Orkin servicing facility. Continue to clean and monitor area. Discussed storage of bagged food ingredients in area. Air gap is not visible at soda fountain drain. Repair was made but not in place. Person in charge added hanging device to correct. Food handlers were not wearing hair restraints. (Discussed new language in food code about restraining hair.). Basement floor needs repainted; must be easy to clean. • Red Zone Neighborhood Grill, 762 W. Main St., Blanchester, March 6. Follow-up. Critical: Chicken wings (cooked) dated Feb. 21; onions Feb. 24. Person in charge corrected/discarded. Note: Mark on products the frozen and thaw dates to represent accurate shelf life of items. Cove trim missing near hand sink in kitchen. Sludge accumulation in corner area under mop sink. Cove trim/wall piece missing in same area. • The Corner Market, 10 Main St., Clarksville, March 6. Follow-up. Critical: Mouse droppings found in dry stock area. Person in charge indicated again will clean, monitor and contact pest control company. Mop sink sprayer nozzle found in sink compartment. Person in charge removed from sink to prevent cross-contamination. Hand-dip ice cream freezer stored in employee bathroom. Old/unused equipment must not be stored on premise. • MacD’s Pub, 1400 W. Locust St., Wilmington, March 8. Follow-up. Critical: Asterisks missing on menu for items needing consumer advisory. New menu to be made, will update. Level 2 certified food protection manager unavailable. Screws in icemaking machine rusty. Slicer has old food debris accumulations. Floor tile missing at fryer area. Exit doors (2) need to be sealed. Between soda fountain machine, sealant missing (needs cleaning and repair). Food splatter on shelf above soup warmer. • Family Dollar, 12 Rolfe Drive, Sabina, March 13. Critical: There were 5 containers of orange juice dated March 8. Employee pulled containers from cooler/service. Thank you! Lights out in middle freezer unit. Mops were stored down in mop sink. • R+L Cafe, 600 Gillam Road, Wilmington, March 6. Follow-up. Level 2 certified food protection manager unavailable. Employee is taking course/exam to gain certificate. All other violations corrected. • R+L Transfer, 600 Gillam Road, Wilmington, March 6. Follow-up. Light nonworking in Aquafina cooler. Wall next to cup storage at fountain machine not easy to clean (looks dirty). All other violations corrected. Thanks for cooperation. • Family Dollar, 303 E. Main St., Wilmington. March 12. Freezer unit has lots of frost build-up on product and shelves. Please check unit to ensure it is working properly. • Wilmington Child Care, 1600 Alex Drive, Wilmington, March 12. Everything looks good. Thank you! • Shop & Go, 1089 W. Locust St., Wilmington, March 12. Outdated containers of Quik chocolate milk on shelf (dated Feb. 18). Milk was removed from service. Thank you. • LaBamba of Clinton County, 961 S. South St., March 13. Follow-up. All previous violations corrected. Thank you!